Of 60 samples (including 54 phD’s), there were a grand total of zero publications behind the sampled signatories that were relevant to climate or climate change. None has specific background in meteorology, climatology, oceanography, etc and just two with a geology background (including one who is now deceased). The IPCC AR4 report has concluded that atmospheric carbon dioxide has reached levels that are higher than anytime during the past 650,000 years. That was a recent update to the literature just several years ago which only went back 420,000 years. These results are supported by ice cores from Antarctica which trap bubbles of ancient atmosphere and allow for confident reconstructions of ancient climates. In the latest issue of Nature, members of the European Project for Ice Coring in Antarctica (EPICA) present the latest, and longest, record from ice cores which extend to 800,000 years. The glacial-interglacial, carbon dioxide, and methane cyclicity remain similar to the previous reconstructions, and the correlation of greenhouse gases to temperature also remains very firm. The latest graph on this is below, from Lüthi et al 2008 (click for enlarged image). Of interest here, is the unusually low levels of carbon dioxide during the two earliest glacial–interglacial cycles. The authors seem confident that they have the CO2 levels right, which extends the pre-industrial CO2 range from about 172–300 ppmv. There could be a long-term CO2 increase by about 25 ppmv from 800 to 400 kya BP, and a long-term decrease of 15 ppmv during the past four glacial cycles, which the authors suggest may be indicative of long-term variations in the carbon cycle on orders of hundreds of thousands of years. CO2 may have reached an absolute minima at 667 BP, though there is slight discrepancy between CO2 concentration measured at University of Bern (172 ppmv) and Grenoble (178 ppmv). In the recent literature, as well as in the supplementary information in this paper, the infamous “CO2 lag” may be overestimated by some hundreds of years, so the 800 year lag at Termination V may be something like 300 years. 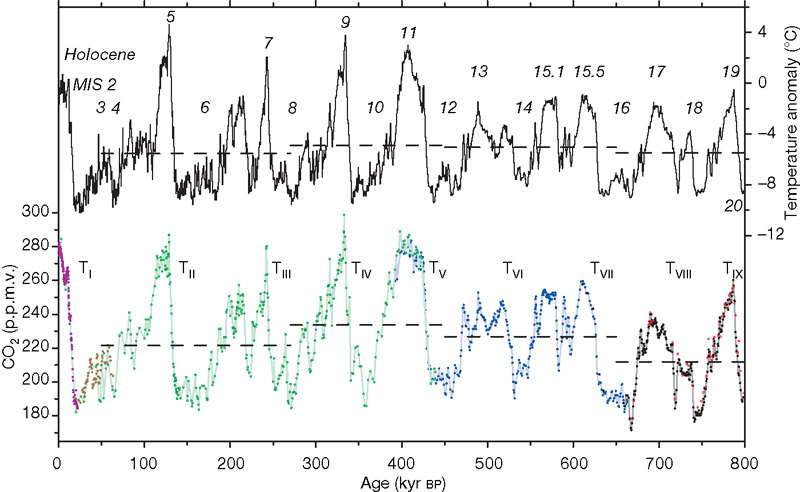 In interesting case is during MIS 14.2 (~550 kyr BP), CO2 preceded temperature by about by a little over 1,000 years. Like many other of the ice core record papers which are blown out of context, the authors emphasize the role of CO2 as a positive feedback on temperatures supporting its greenhouse role. Meanwhile, methane (See Loulergue et al) has fluctuated between around 350 and 800 parts per billion by volume (ppbv) over glacial-interglacial cycles, but over 1,770 ppbv during present day. Interestingly, methane seemed to follow the eccentricity signal more during the earlier cycles, but the methane levels appear more precession-paced since ~400 kya, which is likely due to changes in wetlands, monsoon systems, and ITCZ. In other news, and going far away from the ice core record to the Paleocene-Eocene boundary around 55 million years ago, δ18O records show an abrupt spike when temperatures soared by 8° to 10°C in high-latitude sea surface temperatures, and 4° to 5°C in bottom water temperatures and tropical SST’s (Zachos et al., 2003). A major negative carbon-13 isotope bump also shows up in proxy records, signifying a massive release of isotopically light carbon, which gives clues to the cause of the dramatic temperature anomaly. Possible sources could have been from methane (decomposition of clathrates on the sea floor), CO2 outgassing from volcanoes, among other things. The mass extinction of benthic species at the time was probably a combination of thermal stress and ocean acidfication. In this latest paper by Panchuk, Ridwell, and Kump, the authors suggest that methane alone could not have caused the calcium carbonate dissolution in the oceans estimated from sediment layers, so a large external forcing from CO2 (perhaps a carbon pulse of ~6800 gigatons) helped out. This would enhance the greenhouse effect significantly, but a lot of that carbon would be removed by the oceans within a thousand years reducing the effect, but data suggests that the PETM lasted perhaps 200,000 years. A very large impulse of carbon would have been needed to sustain the warming over millennial timescales given that ~80% of it would be removed by the oceans in around 1,000 years. Interesting week. Not too much to be excited about though as we keep burning fossil fuels, and nothing new for policy makers to hear. So it appears that Florida has now decided to actually teach science in their science classrooms. After a February 19th vote, the United States science curriculum made the improvement from worse to bad, now allowing the young padawans to learn evolution in class. The infamous motto of “Teach the controversy” (like gravity and cell theory) won 4-3, but of course with the scientific caveat that “it’s just a theory.”; my guess is that lecture begins right after discussing “hypothesis,” “theory,” “law” definitions in chapter 1. Now, reading this new Nature article, it looks like the Institute for Creation Research wants to grant online master’s degrees in science education in Texas. But I loved the next line, which reads, “The ICR accepts the Bible as literal truth on all topics. According to its website, the palaeoclimatology class covers “climates before and after the Genesis Flood””. Maybe someone like Paul Reiter can moan about the IPCC not covering creation paleoclimates in the report…too bias I suppose. Chris Colose even finds a book here. There you go, now we don’t need to hear about “CO2 lagging temperature” anymore. From our interpretation of the “young ice cores” the CO2 levels and temperatures fluctuated significantly over just a few thousand years…we’ve even gone through several ice ages since the global flood. Aside from the obvious climate pitfalls of a young ice sheet hypothesis, the other argument reads like “there were WW2 planes found deep in the ice sheet” so it must be a young ice sheet, but this discounts the fundamental fact that glaciers flow and so ice at the bottom is much more compacted than ice at the top. This means one meter of ice core at the bottom represents a much longer amount of time than one meter of core near the top. So what about that global flood? A new record low 2008 sea ice extent?? Much noise has been made over the internets about “sea ice recovery” this year, along with a list of other noisy distractions, like “Global Warming stopped in January 2008” (after it stopped in 1998). But does that mean it has recovered? Most definitely not. The ice covering the Arctic Ocean is much younger and thinner than normal, and 2008 might in fact be a new record low. The previous record low was 2007 which beat out 2005 (lucky #2) by the size of California and Texas combined. The colors are ice age, with green and purple being older ice, 5 and 6 years old. The older ice is rapidly being lost. Meanwhile, Colorado researchers say there is a 3 in 5 chance that 2008 will have a new record low. Mr. Atmoz also has a post on this. It is my non-quantified opinion that we’ve hit one of the first “tipping points” as far as global warming is concerned, or at least we will over the next few years– a commitment to seasonal loss of arctic sea ice regardless of what we do to CO2 emissions. We’ll be able to see by autumn if summer ice hit a new low, so stay tuned.